UPDATE: 6/17/15 – Maria has been found. 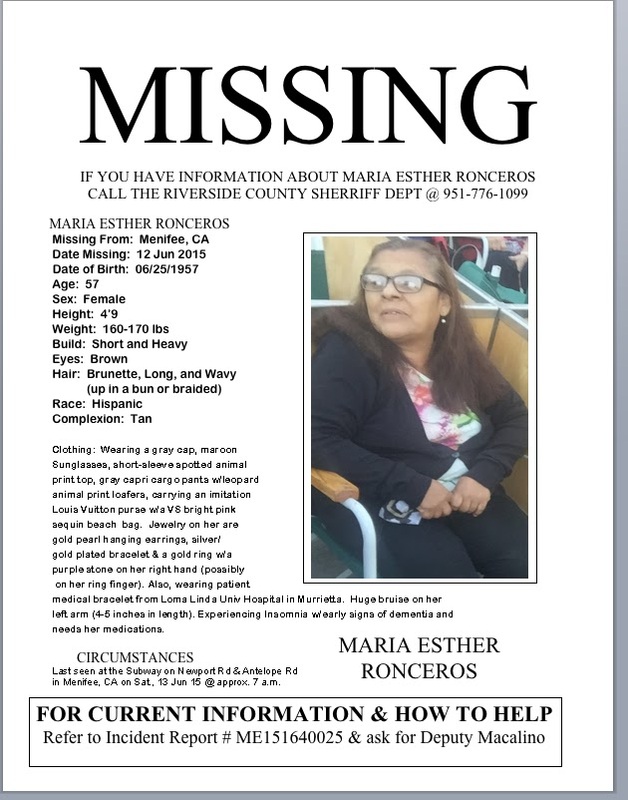 Maria Esther Ronceros, 55, is missing from Menifee, Calif. since June 12, 2015. She was last seen at the Subway on Newport Rd. and Antelope Rd. on Sat. June 15, around 7 a.m.
Maria was wearing a gray cap, maroon sunglasses, a short-sleeve spotted animal print top, gray capri cargo pants with leopard animal print loafers, carrying an imitation lOuia Vuitton purse with a VS bright pink sequen beach bag. She was wearing gold pearl hanging earrings, silver gold-plated bracelet and a gold ring with a purple stone on her right hand. She also has a Loma Lina Univ. Hospital medical bracelet and a hug bruise on her left arm. She is experiencing insomnia and has signs of dementia and needs her medication.